I don’t like to write about auction decoration ideas. If it doesn’t make you money, I’m less inclined to spend time educating you on it. And rarely do auction decorations make you money. But many of the volunteers on your benefit auction committees LOVE talking about decor, don’t they? They get excited planning the colors … considering the centerpieces … thinking of ways to incorporate fun elements. It pains me that your budget for the decor may grow out of control. Sadly, I’d also be willing to guess that it’s a lot easier to get volunteers to sign up for the decor committee than to sign up for the procurement / acquisitions team. So all that said, here’s an idea that is affordable AND elegant. You might equate balloons as something appropriate for a child’s birthday party, but not a benefit auction. Or you might consider balloons (especially the 11″ traditional size) appropriate for a school auction, but not a nonprofit gala. With me standing next to them, it gives you a sense of the balloons’ size. These photos will convince you otherwise. 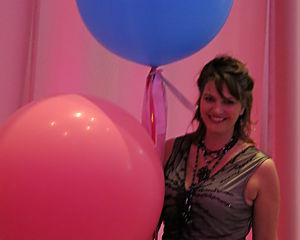 These over-sized balloons measuring 3′ and 4′ lended an air of sophistication to this nonprofit gala of ~420 guests. They were used in the silent auction (in multiple colors) and in the ballroom (in shades of pink) to beautifully fill the large space. They created a “dropped ceiling” effect. The helium started to wane in a few of them by night’s end, but most of them stayed up and looked great. Not too expensive and it looks beautiful. Don’t you think so? Here’s another resource for you, if you’re thinking this idea has legs. It’s written just for you! Very nice! Unique. 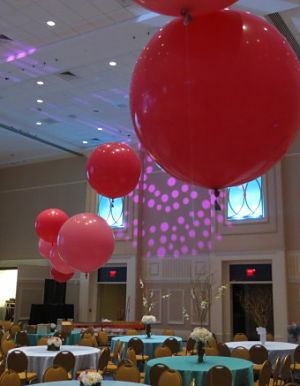 Most decorations include the smaller-sized balloons. I’ve had great luck with MYLAR balloons (the thick “foilish” ones) versus latex (the thin, “typical balloon material”) ones with my volunteering work. The mylar balloons stay up (strongly) through the entire event…and last for days afterwards…ugh. I tend to use them for an event, then donate them through freecycle, to a children’s hospital, to other groups for their events, etc. Mylar balloons are also refillable, but that means deflating them (or waiting days for them to deflate) and storing them. They don’t usually look new once they’ve been used (can get scratched up), so I prefer just to pass them along to someone else to use once we’re done with them right then. I’d love to see if the giant balloons come in mylar (but they’d surely be cost-prohibitive). You can also purchase the mylar balloons online (ebay, party superstore websites, etc), then fill them as needed for events to save money. For one event, we’d use the same theme (smiley face) mylar balloons, so I stocked up on those and pulled out a new set for each event (then passed it on – paid it forward, as it were!). Thanks for sharing your balloon info. Thanks for the ideas / suggestions, Jana. Sounds like you brought smiles via balloons to TWO groups, given your donation post-event, too. Great article and a very effective use of those jumbo balloons. Beautiful photos. Obviously, as a balloon professional, I’m partial to using balloons for most any sort of event (with proper thought and design), so thank you for spreading the word and showing people that balloons can do more than most people think. Thanks for visiting the blog, Sandi. I’m not sure if this is “your thing,” but here’s an older post also using balloons. 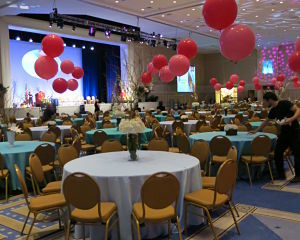 You might enjoy it: https://www.redappleauctions.com/balloon-gala-centerpieces-nonfloral/ Creative uses in both cases!